4 Bdrm Detached Executive bungalow. V/bule. Reception hall. Lounge. 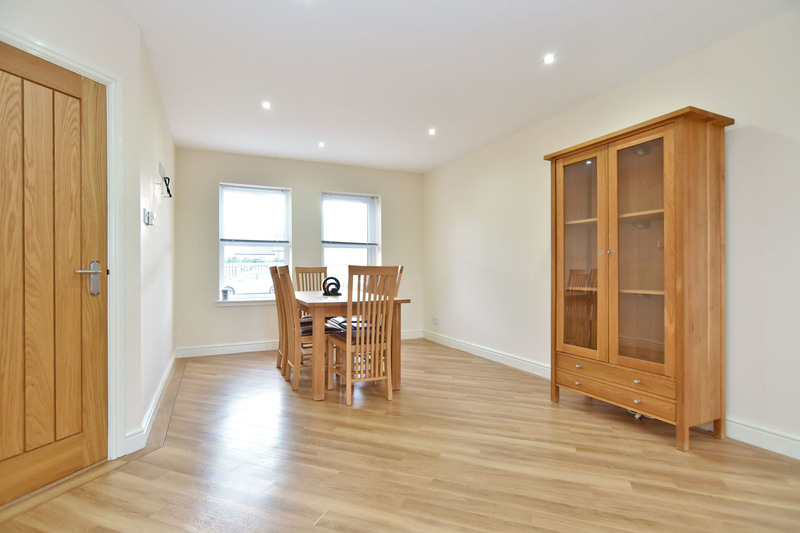 Family rm/Dining rm/Kitch on open plan. Utility rm. 4 Bdrms. 1 with ensuite & dressing rm. Bathrm (CT band - E). Garden. Garage. Parking. Price over £295,000 Entry by arr. Viewing contact solicitors. (EPC band - D). 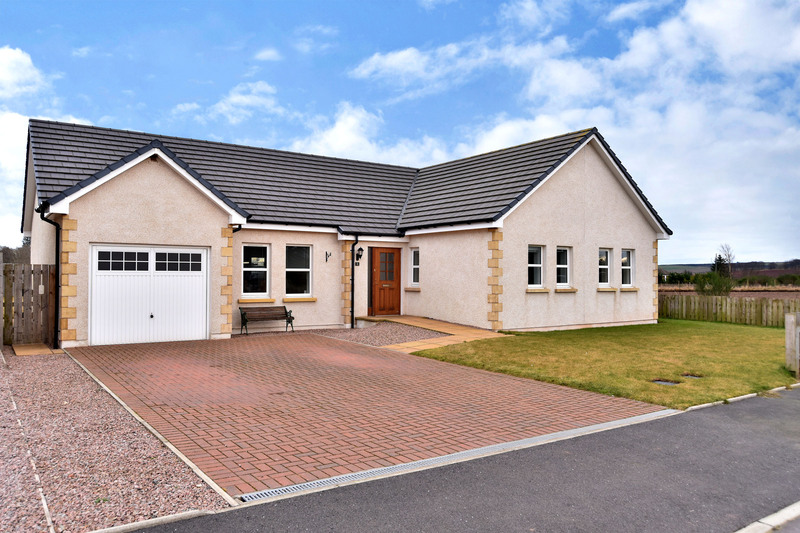 The Law Practice is delighted to offer to the market for sale this beautifully appointed four bedroom detached bungalow with garage, generous gardens and lock block driveway. The property is set on an extensive plot in a peaceful cul-de-sac of this modern development completed in recent years by Bruce Estates. Fordoun is an established country village located just off the A90 within a few minutes of the growing town of Laurencekirk. Fordoun itself offers primary schooling, a village hall with thriving community activities and a local pub. There is also a well known farm shop to hand. Laurencekirk offers secondary schooling at the modern Mearns Academy as well as a wider range of shopping and local facilities. 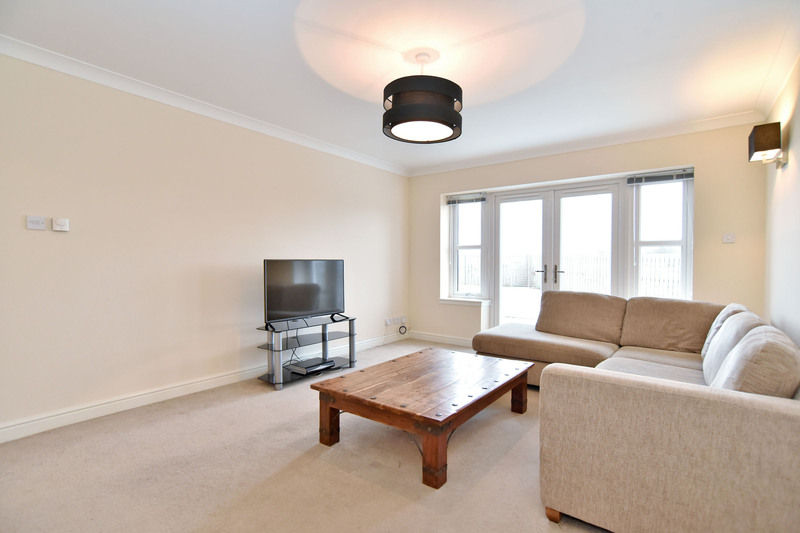 Stonehaven and Montrose within a short drive offer a greater choice of shopping as well as the attractions of the beach and of course the cities of Aberdeen and Dundee are within an easy commute. 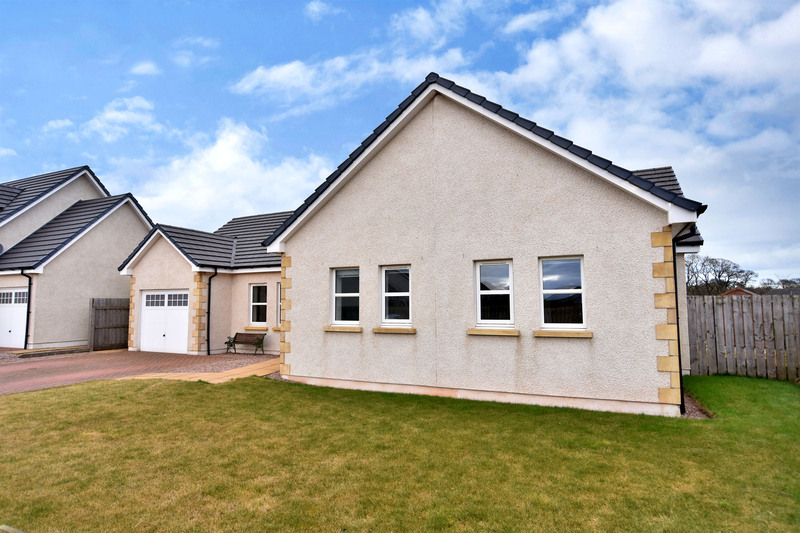 This home offers a fantastic level of accommodation including formal lounge, fabulous family room/dining room/kitchen on open plan, utility room, family bathroom and four double bedrooms, one featuring an en-suite shower room and walk-in dressing room. There is also an attached double garage. The lovely home is presented in fresh light décor with large windows to all aspects ensuring wonderfully bright and welcoming space. 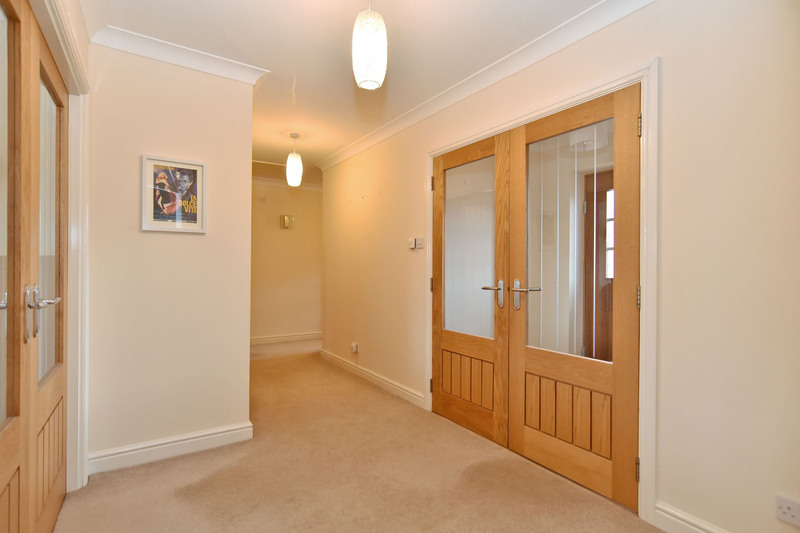 There is a mix of high quality easy maintenance flooring and carpeting throughout with attractive oak joinery completing the finish. This generous particularly well appointed family home offers fantastic value for money and early viewing is highly recommended. Reception Hallway (19’5” x 7’4” approx.) 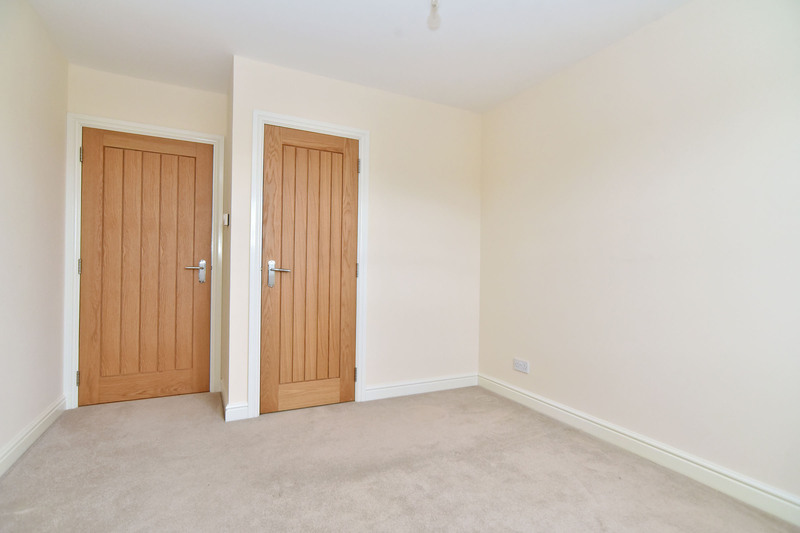 A continuation of the neutral décor and carpeting and affording access to the main accommodation. 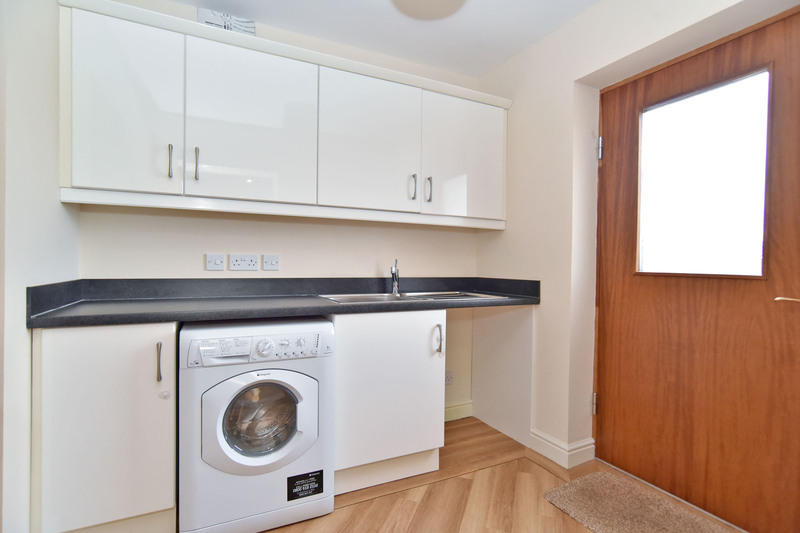 A full height double cupboard houses the boiler and Air Source heating unit which is zoned room by room. Additional full height cupboard offers excellent storage. Lounge (16’11” x 12’10” approx.) 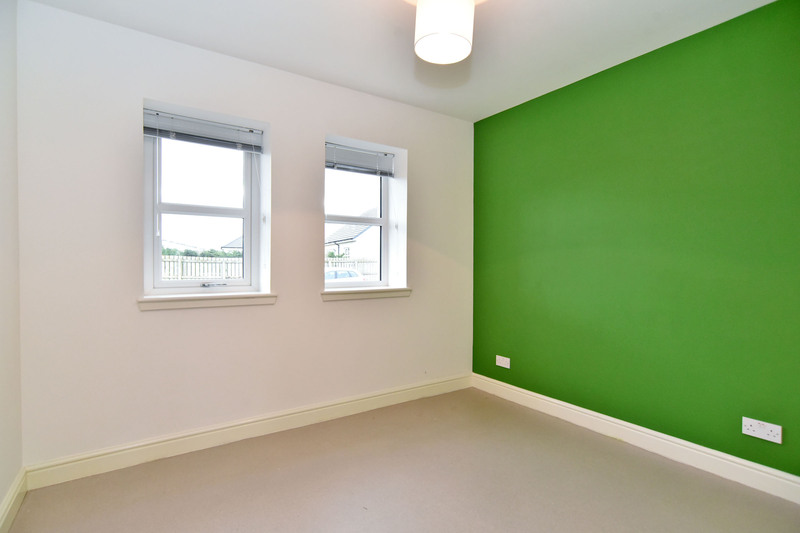 A lovely bright room benefiting from patio doors and a side window opening to the rear garden. Fresh light décor. Ample space for a range of formal furniture for relaxation. Family Room/Dining Room/Kitchen on Open Plan (26’6” x 15’10” approx.) A stunning room perfect for modern living enjoying windows to two aspects with extensive views to the countryside beyond. 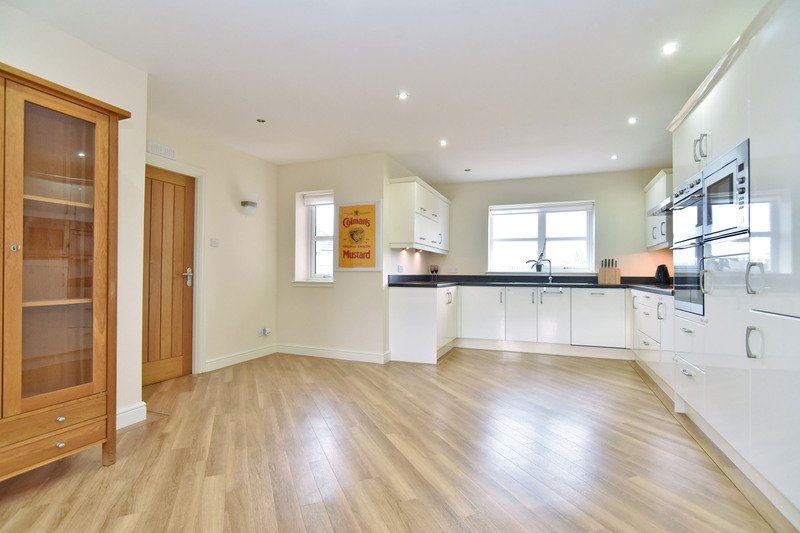 This dream of a room is appointed with a fantastic level of sleek units to floor and eye level incorporating soft close drawers with graphite toned worktops and splashbacks and stainless steel splashback to the cooker. The fridge freezer, microwave, grill, oven, fan oven, five ring Smeg electric hob, cooker hood and dishwasher are included in the sale. There is a TV connection in the family room area and ample space for a generous dining table and chairs and relaxed seating. Utility Room (7’9” x 7’7” approx.) 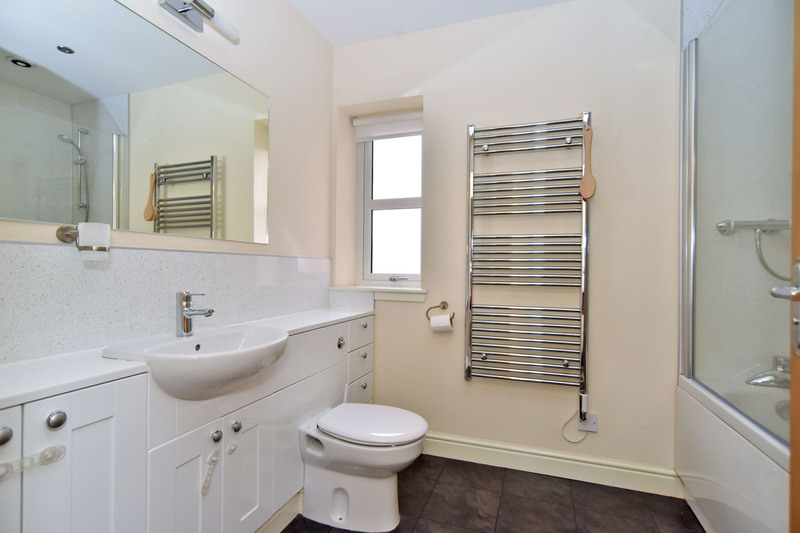 Particularly useful to the family home and fitted with smart units with sink and drainer. Space for washing machine which is not included in the sale. Finished in Amtico flooring and light tones. Half glazed door opens to the rear garden. Door to the garage. Master Bedroom (12’9” x 10’7” approx.) A super double room peacefully located to the rear of the property and enjoying views extending to the hills beyond. Presented in soft light tones and neutral carpeting. En-Suite Shower Room (6’9” x 5’3” approx.) Attractively presented with the WC with discreet cistern and wash hand basin fitted in vanity units with mirror, light and shaver socket. Double walk-in shower cubicle complete with aqua-panelling. Extractor fan. Modesty glazed window. Ladder radiator. Dressing Room (6’1” x 5’7” approx.) 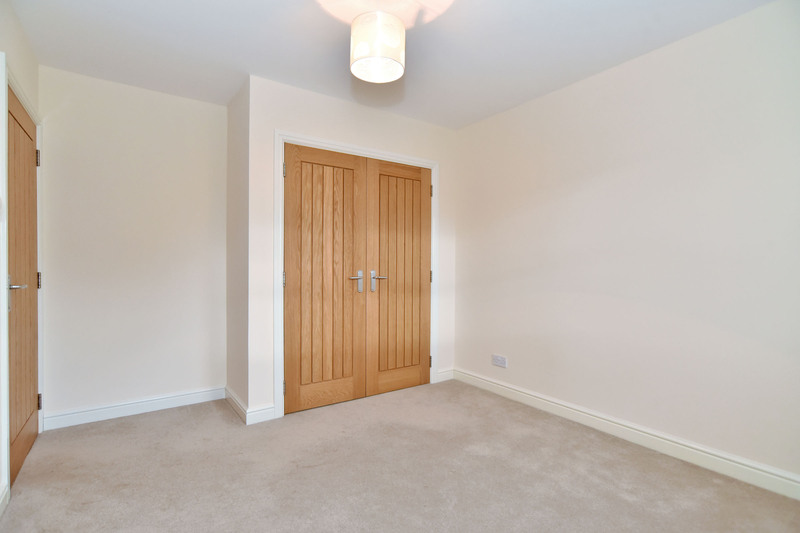 A fantastic addition to the master room this deep walk-in dressing room provides extensive storage. Double Bedroom 2 (12’4” x 10’2” approx.) This room looks out to the front of the property from the twin windows. Again completed in light décor with complimentary carpeting. A double fitted wardrobe provides hanging and shelf storage. Double Bedroom 3 (12’9” x 10’1” approx.) 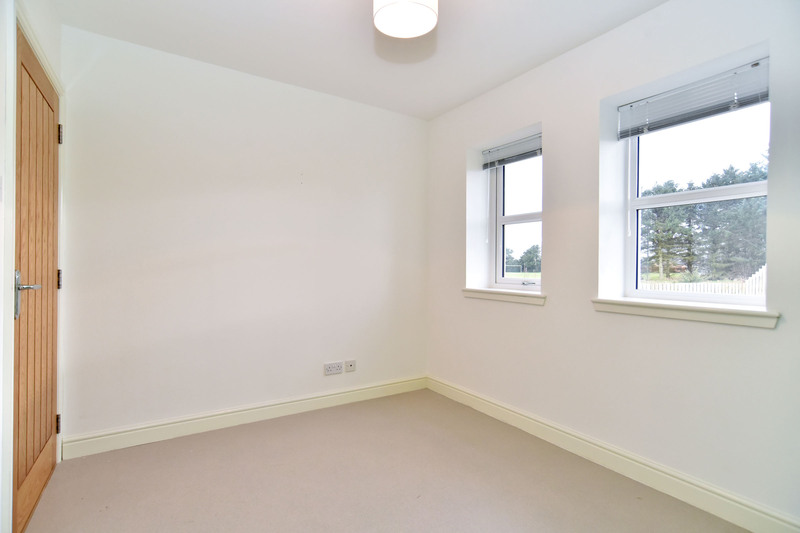 This time located to the side of the property and enjoying stunning country views from the double window. Built-in wardrobe with storage. Double Bedroom 4 (10’2” x 8’6” approx.) 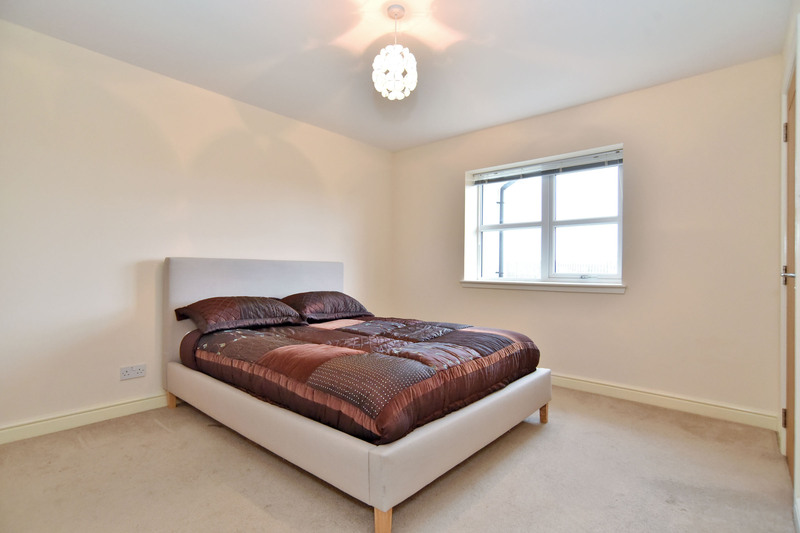 Completing the generous bedroom accommodation this room is located to the front and is light and bright with twin windows. 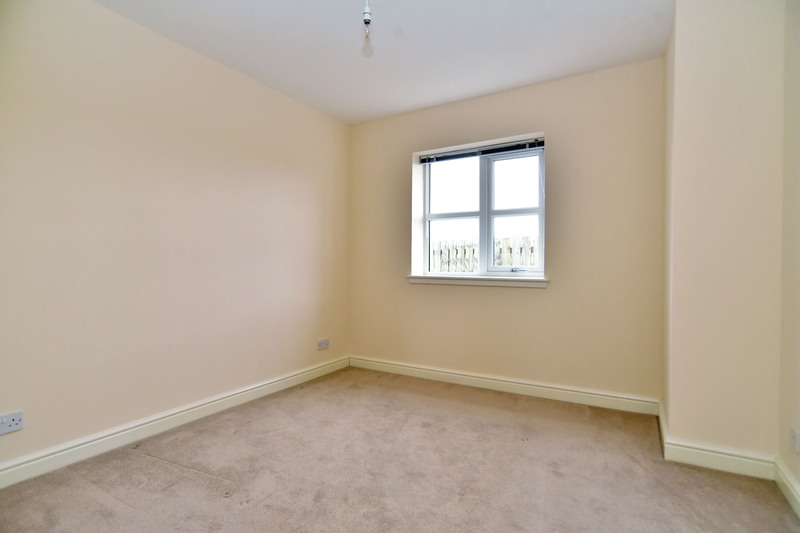 Fresh décor with a contemporary style feature wall and easy maintenance flooring. Family Bathroom (8’4” x 7’ approx.) 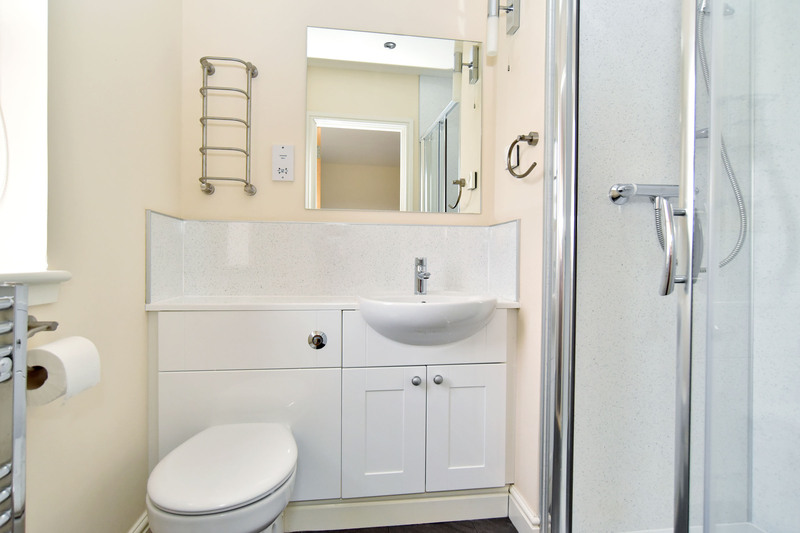 A wonderfully spacious bathroom with a three piece suite in white with the wash hand basin and WC fitted within modern vanity storage. Over bath shower. Aqua- panelling to the bath and splashback. Display shelving. Feature light. Modesty glazed window. Ladder radiator. Soft effect tiling to the floor. Outside Double garage with lock block driveway providing off-street parking. 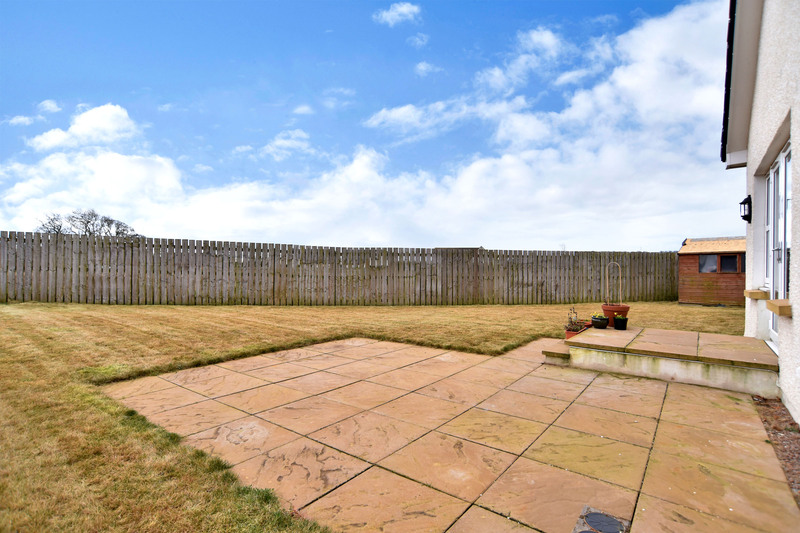 Generous fully enclosed lawn to the rear affording ample space for children’s play, relaxation and alfresco entertaining. Directions Leave Aberdeen city centre travelling south on the A90. Continue past Stonehaven taking the right turn signposted to Fordoun. Continue in to Fordoun and veer left of the railway bridge. Continue a short distance along and turn right in to Pittengardner Crescent. Continue along this road and Pittengardner Close is situated at the right hand side. Number 3 is at the end of the cul-de sac.